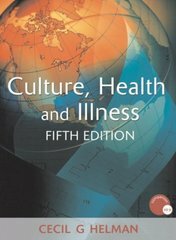 Culture, Health and Illness 5 Edition Culture, Health and Illness is the leading international textbook on the role of cultural and social factors in health, illness, and medical care. Since first published in 1984, it has been used in more than forty countries, in universities, medical schools, and nursing colleges. This new edition meets the ever-growing need for a clear starting point in understanding the clinical significance of cultural and social factors. Addressing the complex interactions between health, illness, and culture, this unique text sets out anthropological theory in a highly readable, jargon-free style and integrates it with the practice of health care using real-life examples and case histories. Features: * Addresses current concerns about the multicultural context of health care * Well supported by empirical examples and case studies from more than ninety countries * New coverage of poverty and inequality of health care, genetics, telemedicine, migration medicine, HIV/AIDS, obesity and malnutrition, and developments in medical technology * Features a free companion website that includes extensive additional material and printable clinical questionnaires: www.culturehealthandillness.com * In color for the first time In today's world of increasing cultural, religious, and ethnic diversity of populations, Culture, Health and Illness, Fifth Edition, is essential reading for students of medicine, nursing, psychiatry, public health, health education, international health, and medical anthropology, all across the globe.